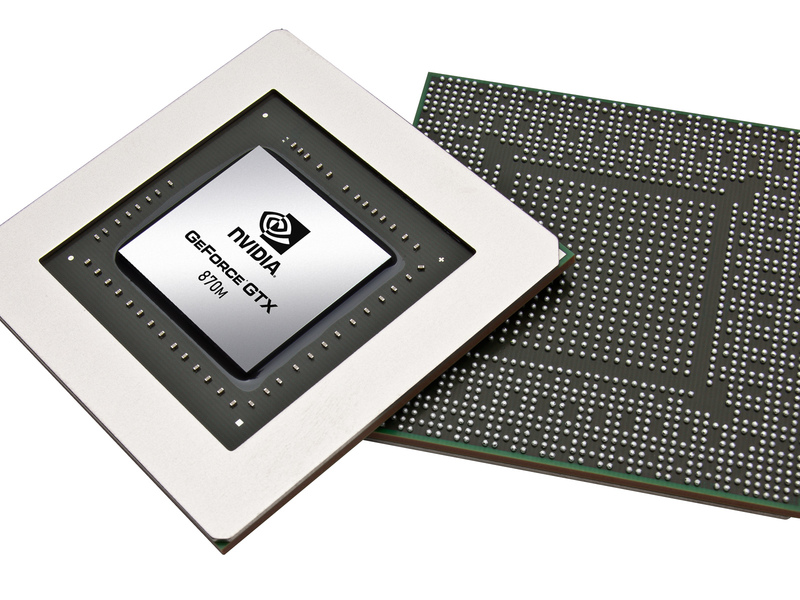 The NVIDIA GeForce GTX 870M is a high-end DirectX 12-compatible graphics card for laptops unveiled in March 2014. Similar to the GTX 880M, it is based on the 28 nm GK104 chip (Kepler architecture), but features less shader cores (1344 instead of 1536) as well as smaller and slower memory (6 GB GDDR5). The Kepler architecture is the successor to the Fermi architecture that first appeared in laptops with the GeForce 400M series. The GK104 Kepler core offers eight shader blocks, called SMX, that are clocked at the same speed as the central core. In the GTX 870M, only seven blocks are active for a total of 1344 CUDA cores and 112 TMUs. The chip can access up to 6 GB of GDDR5 memory (1250 MHz, 5000 MHz effective) connected via a 192-bit interface. Compared to the old GeForce GTX 770M, the GTX 870M offers significantly more performance thanks to its higher clock rate and the additional shaders. Therefore, the 870M is just slightly slower than the GTX 680MX and the Radeon R9 M290X. The GPU has enough power to run demanding games of 2013/2014 (e.g. Battlefield 4 or Thief) fluently in FullHD resolution and very high detail settings. The power consumption of the GeForce GTX 870M should be similar to the the GTX 780M, leading to a TDP of at least 100 W. Therefore, only large desktop replacements can handle the power demands of a GTX 870M.